Earlier last week i scored a CX-22 Trakball from ebay for a fairly low price (10.50 shipped) I wasn't expecting much, however it did say tested and working..so i took a shot. Once i got it home, i could feel the ball was noisy and sticking horribly. Again, expected. I plugged it into my 7800 straight away, and of course, nothing worked but the left fire button, using Centipede7800 (official release) to test it. Zero movement. I opened it up, Gave the ball a serious soak, Cleaned all the rollers, and Bearings, cleaned the housing and board as best i could. first thing i noticed (beside the filthy gunky rollers and ball) was the wiring felt "off" like perhaps it was worked on, as there was a good amount of electrical tape just holding stuff together. At this time i should point out i know zero about electronics/circuitry/soldering etc. i noticed the center post of the right fire button was broken, so i left that be for now. I plugged it back in, while open, and fired up centipede. Both buttons worked when pressing directly on the board it'self, and there was some movement when spinning the wheels. after a good 3 hours of cleaning i put it back together, hit the 'Pede again, and now i had some movement, however seriously eradic. This is where i am kinda stuck. I know it's a shot in the dark but i assumed since there was "some" movement after cleaning, that it's just a physical thing. But it's probably electrical huh? i checked some much older threads, and a few people mentioned testing via a meter. Again, i have zero knowledge let alone the equipment. Would there be any other troubleshooting someone could walk me through? or perhaps if i posted photos of specific areas? PS i tested with it in joystick and TB mode, and it's basically the same. Any help would be appreciated, i would just love to see my little girl blasting bugs with a trakball, she fell inlove with an arcade cabinet of Centipede at her summer camp, and it would be magical to surprise her! oh yes, im aware. This was tested in joystick mode as stated. But also tested with 2600 Missile Command. Would using these original release cause the issue's im having? Curser just auto moves to the upper left or lower right,(or any random combo..) with some heafy pressure rolling, i can get it to move slightly, but curser just slides right back to where it "wants to go"
all the rollers/bearings have been cleaned well as well as the ball. Here are some Photo's i took after cleaning it the other day. All the wires had been taped up like that, just it was realllllly filthy. I think i did ok cleaning it as best i could. But i have no electrical/soldering knowledge, so im kinda lost... Does anything stand out to you guys? Are the rollers spinning when you roll the ball normally? Could be the optical sensors since these often go bad. Maybe they got gunked up with everything else.try cleaning the sensor slots with alcohol prep pads from Walgreens, etc. (small wipes). I would also check continuity at the 9-pin plug to the board with a multi-meter, since cords are a common breakdown point due to stress. Edited by Swami, Fri Jun 2, 2017 9:01 PM. 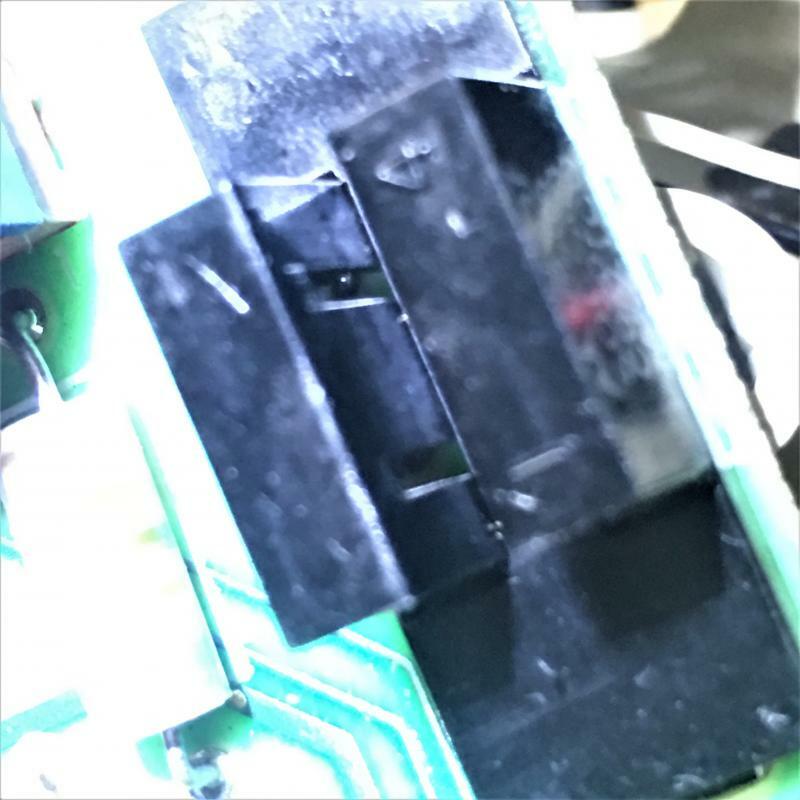 Your biggest problem will be if the gunk caused a short and fried something or the optical sensor is worn out, then you might as well get a new one unless you want to find someone to refurbish it, just for sentimentality. 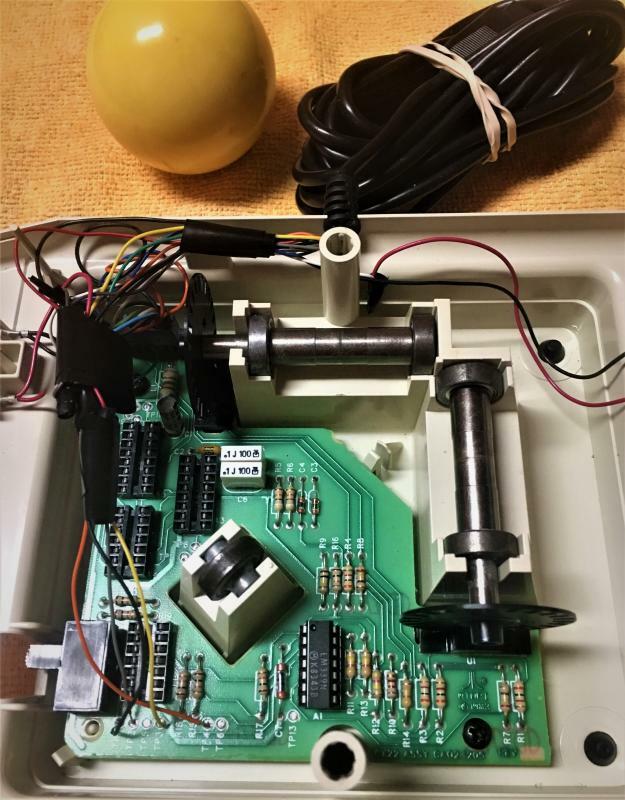 I got a Colecovision trackball cheap because one of the buttons didn't work. Turned out it just had something resin-like on it that I removed by opening the case and scraping it off. Now it works like new. Edited by Swami, Fri Jun 2, 2017 9:30 PM. Hey Swami. Ya if I lay the ball on top of the spinners/bars while they are seated, and roll the ball, everything seams to be moving even, smooth and in the right direction. I assume the sensor is the black plastic U shaped "box" the black wheels rotate through. It seams as clean as I can get it, unless I should be removing more pieces..
My main worry was the 9pin or wires as I don't own or know how to even use. Meter to test that stuff. I can assure you that's not what the wiring originally looked like. Without spending time reviewing the schematic, I'm guessing that the rewire job may have been to change the behavior of the trackball. I suspect, given your description of your skill set, that you did not remove all of those missing chips. The only chip left is the 339. One of its jobs is to buffer the signals from the optical encoders. If I were modding this trackball to output pure, quadrature encoded/gray code signals, I believe I could do it and leave only the 339. They type of mod I'm suspecting would have been done to use the trackball as a mouse on, say, an Atari ST or Amiga computer. But, the sort of protocol I think was being targeted would be applicable to a lot of other devices in the world including arcade games and industrial controls. I'm fairly certain that there weren't any back-in-the-day titles that would recognize that sort of control protocol, but there are some recently created games that would recognize it. If you have access to a Harmony cartridge, you could download and try one of those games. It could take some effort to completely unravel what's going on here. 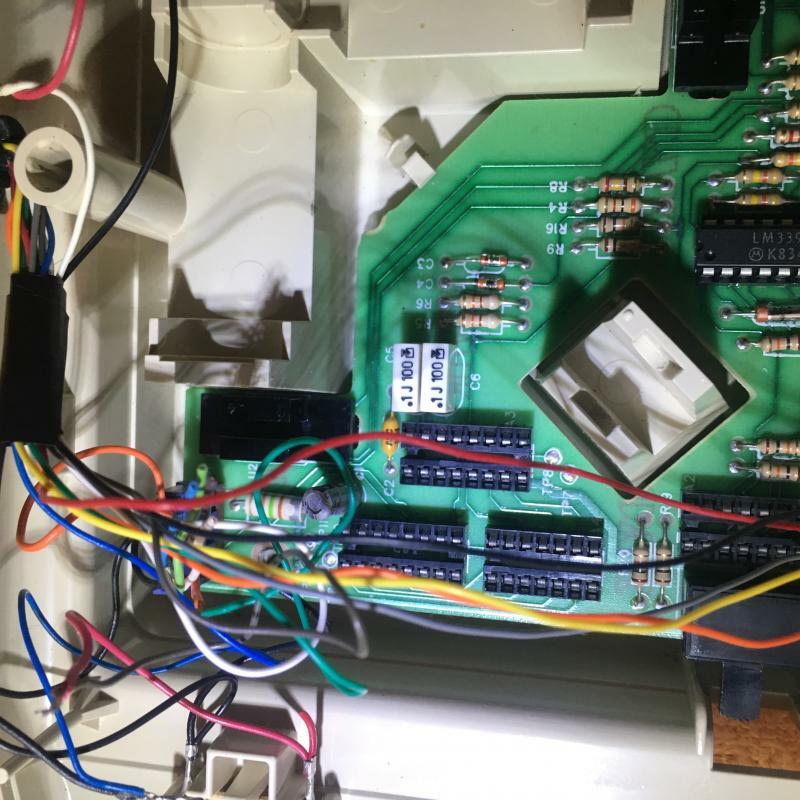 If you can, you might contact the seller and ask them what their test setup was when they verified that it was working. Decided I should take a quick look at the schematic. Test points 1, 2, 3, and 4 would be the spots to tap into if doing the mod I mentioned above. In your picture, that looks like where the wires are attached. So, if they didn't botch the wiring, this thing might yet be usable even if not for your originally intended purpose. On the other hand, the 339 chip or an encoder might be bad. And, I'm with you. That wiring is a bit scary. It looks like they just wadded up the extra wire length instead of cutting it to fit the application at hand. They may have wanted to be able to reverse the mod. Maybe you can salvage this thing. All of the missing chips are readily available. 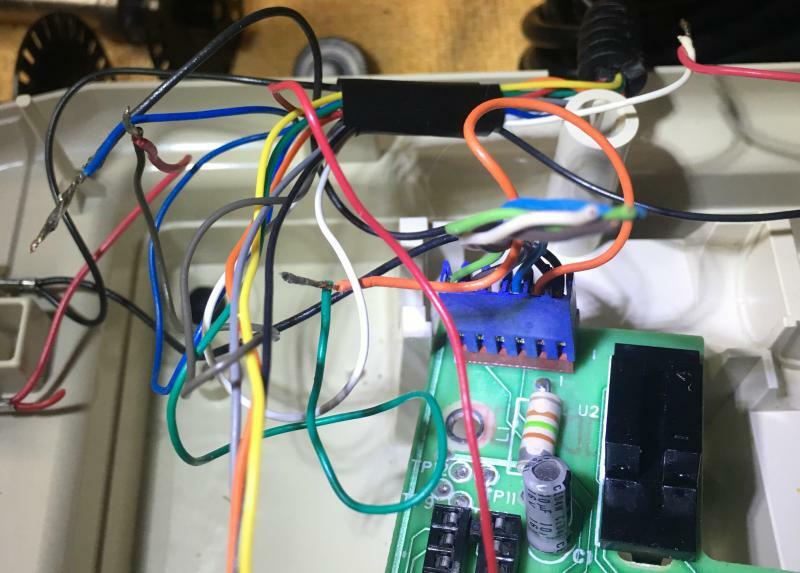 If you want to take off that tape and take some detailed pictures of the wiring joints, I or some other experienced person can offer an opinion on how hard it would be to put the wiring back to original. If you want to take off that tape and take some detailed pictures of the wiring joints, I or some other equally experienced person can offer an opinion on how hard it would be to put the wiring back to original. Am I right that the chip bases are sockets, so he can just push them back in, no soldering experience required? The rewiring may be a problem for him tho'. Correct, they're sockets so the chips could easily be re-installed. I contacted the seller and got him to finally admit he got it from a flea market.. So there are actually chips missing? Hm ok I guess next time I'll just look up and schematic and compare. Edited by Kaiju, Sat Jun 3, 2017 8:40 AM. 4 of the 5 chips are missing. Yeah, post up what you get. If you're willing to learn, this group is generally pretty willing to share knowledge, information and practical experience. You should be able to get something going. okay, here are some , let me know if there is a specific area to check. found more tape under the tape.. then some twisted together wires..
Edited by Kaiju, Sat Jun 3, 2017 9:16 AM. It looks like they grafted in a different cable, probably because the original didn't have a pin that they needed. So it's likely that all the necessary conductors are there that would be needed to wire it back to original. 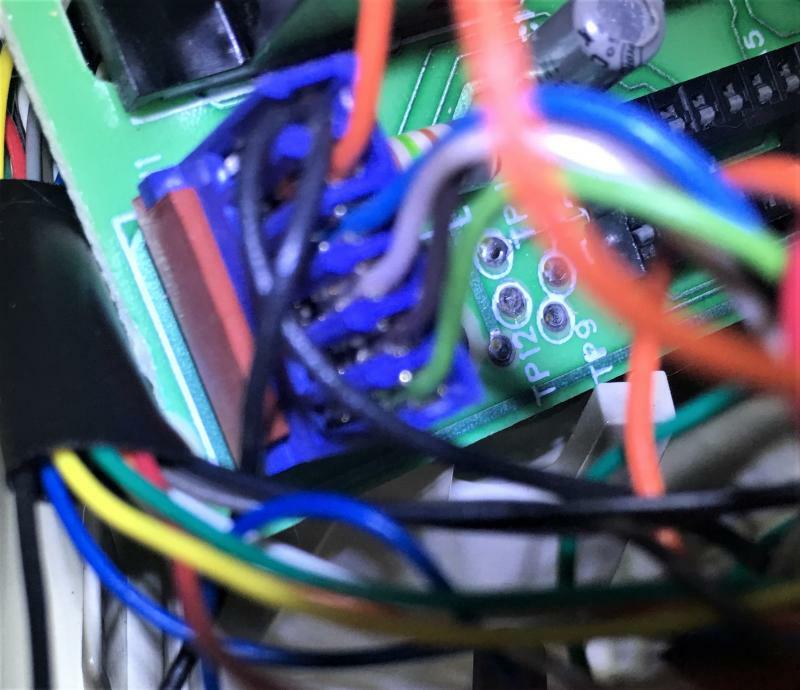 The bad news is that you really should solder the wires together if you reconfigure back to work as stock. Sounds like you don't have soldering equipment. You *could* twist them and apply wire nuts or crimps, but that wouldn't be as reliable. 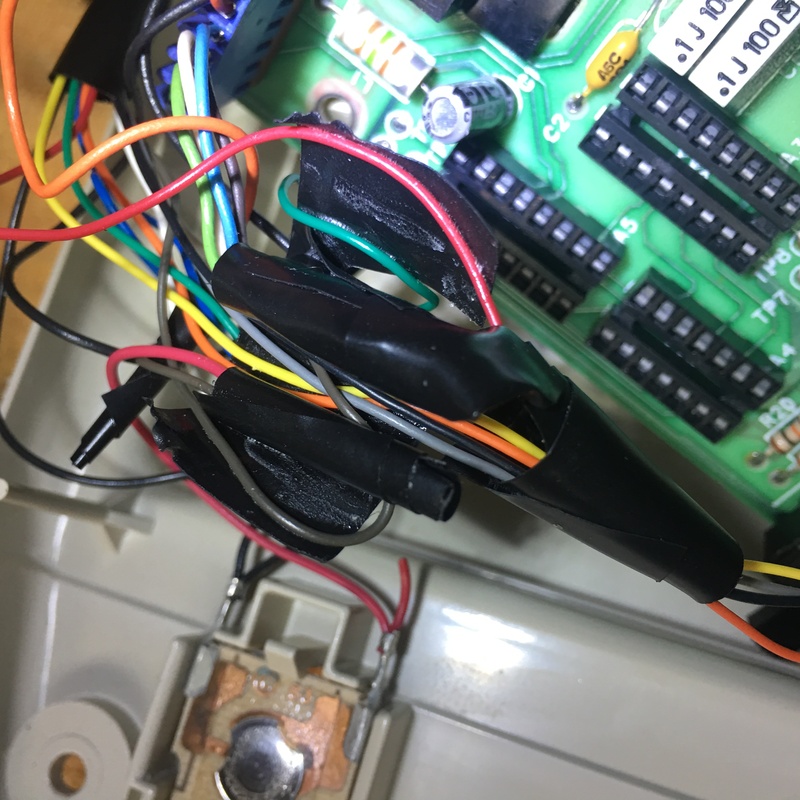 To trace out the cable and identify which wire connects to which pin at the other end, you'd need some sort of tool. A passably functional multimeter can be had for under $10. Harbor Freight just had some for $5.49 that would do the job. 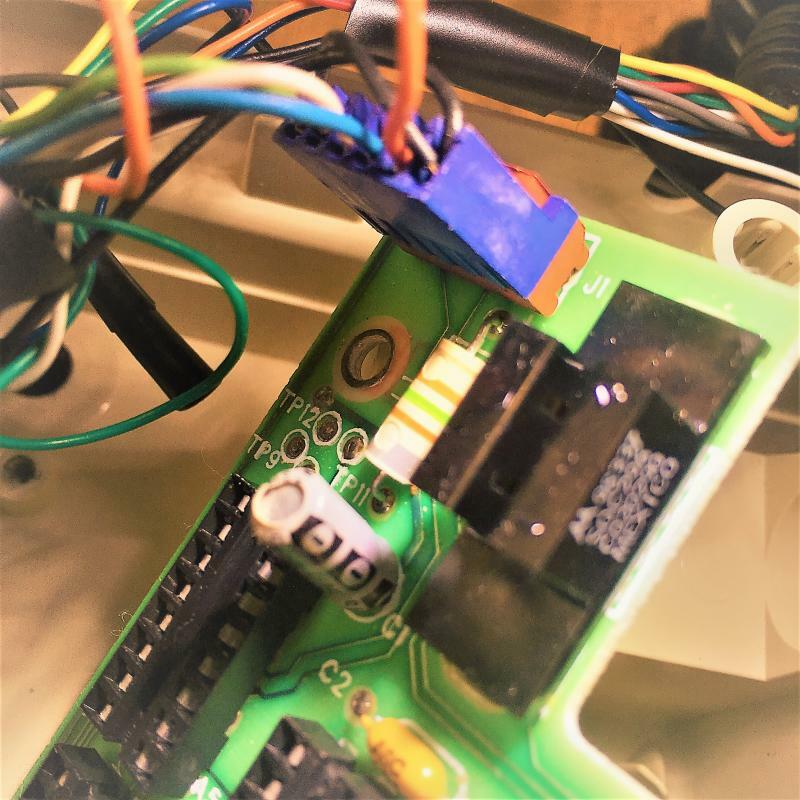 You'd use the "ohms", resistance or continuity tester to determine the pinout of the cable and make yourself a map that correlates wire color (at the end inside the controller) to pin number (at the plug end). That information would be used in the process of rewiring the cable. The missing chips are the key. If they're available at a very low price it'd be worth attempting to get this thing going. Look at page 33 of 36 (5-13 original section/page number) in the field service manual I linked to above. The A1 through A5 parts are the chips. The LM339 is the one you have. The other four are the ones you need. Honestly, it'll be a crapshoot if you get these chips from a non-working unit. 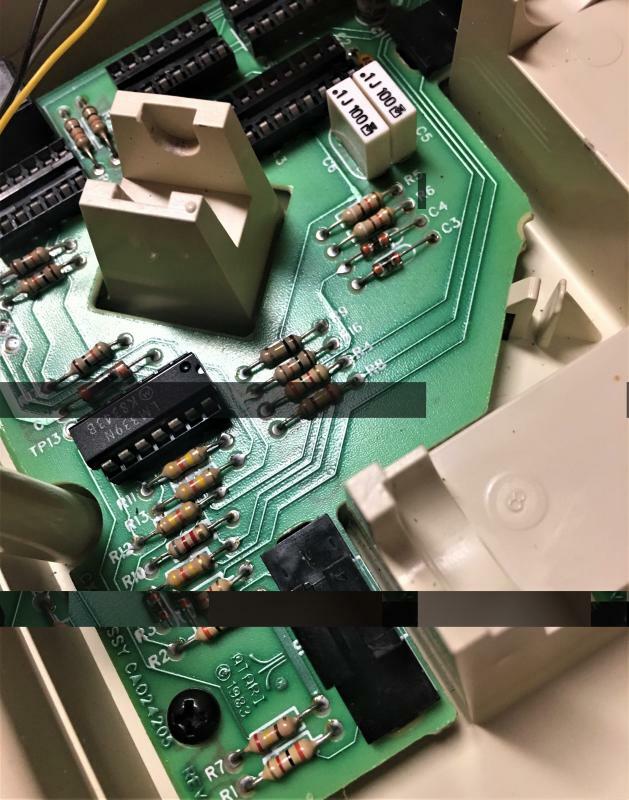 One of the chips might be the reason for the failure in that unit. That button with the broken/missing pin: my CX22 has the pin broken away from the button on one side but the pin is still present and the button works. So, you might be able to substitute something else in there for a pin. I dunno, since you're a chef, maybe a piece of angel hair or spaghetti. 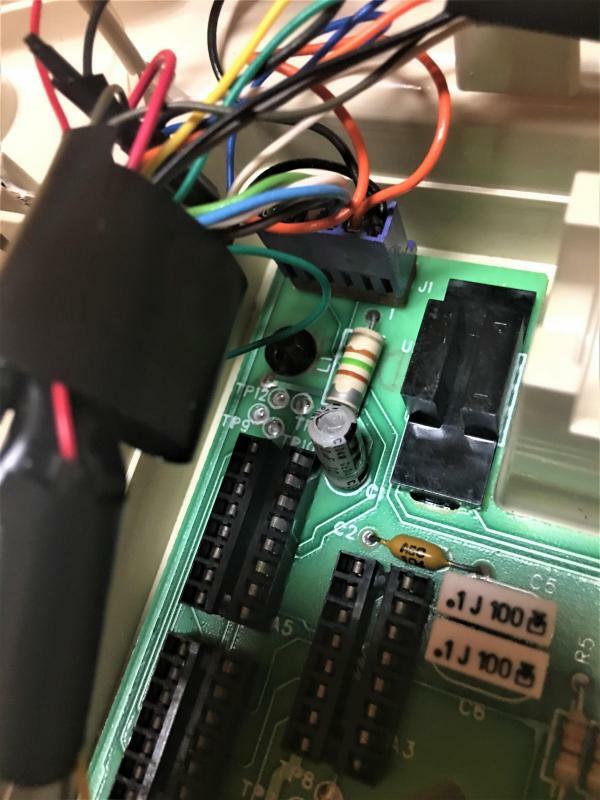 If you're planning on buying a Harmony or some other 2600 compatible flash cartridge, you might wait on reworking the controller until after you have that. This thing might just work as-is if you get one of the game versions that can understand the language that your trackball now speaks. Big, i cannot thank you enough for your time and knowledge. I'm heading to homedepot to get some stuff for the wife, Im just going to pickup a tester and a soldering iron, if anything just to have for next time. The seller is sending me some photos later of some other "dead" units he has, he said it's no problem and he will send what i need, no charge. I.C.,4013B, I.C.,4538B, I.C.,4011B, I.C.,4019B. He's working on finding the 4th, This was what he told me, though honestly i have no idea what he means..
but i will make it right"
Don't know why he started talking about EPROMS, none of these are EPROMS. Honestly, it'll be a crapshoot if you get these chips. Hands on those chips. 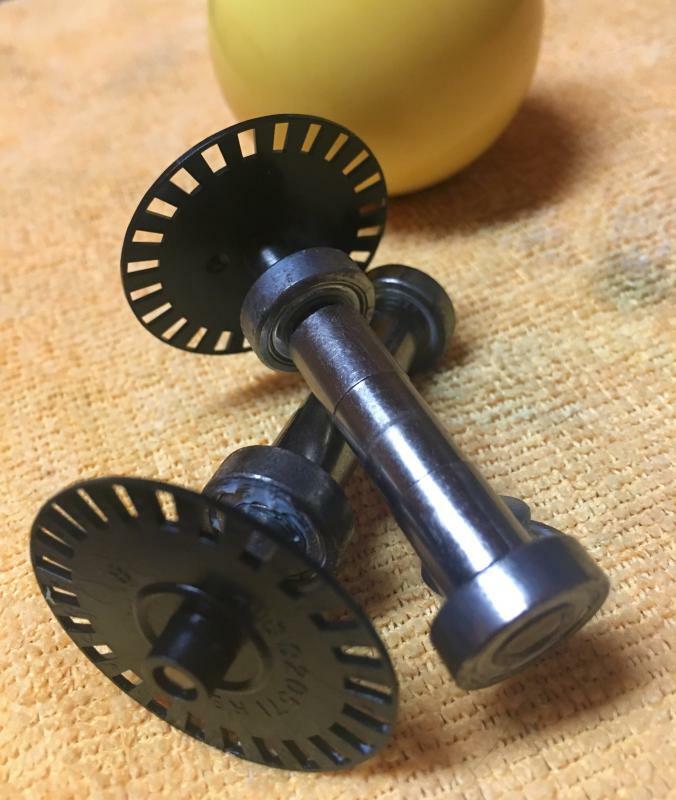 Is there another source for them other than this same model trakball? An example just came up.. I found a CX80 on eBay for repair. Would the board inside have the same chips I would need? I think the two models have some chips in common, but the chips on the CX80 are not socketed. Jameco, for example, has the 4013 for $0.49. Minimum purchase and/or shipping would probably be a killer with that type of outlet. It wouldn't be out of the realm of possibility to find all of the chips available at a single seller on eBay or Amazon. May be worth a look.